The DUCKLINGS (one of my favorite stories because everyone told me that ducklings rarely survive)! We got a call that a MaMa Mallard had been hit by a car and that her 4 ducklings were lost and confused. They were following around human beings, hoping for some guidance and direction. The ducklings were brought to us. They were smaller than the palm of my hand when they first came. 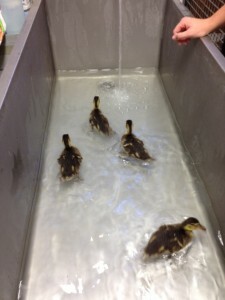 The ducklings were weighed several times a week and doubled their size at each weigh in! They lived in a child’s play pen with a shallow pool, heat, and a stuffed animal “mommy.” As weeks went by, the ducklings got a larger pool and eventually they began taking daily swims in our large tub. They learned to dive and to catch crickets. Finally, the 4 ducklings were old enough to be released. They were released back in Big Bear Lake. As the 4 siblings ventured out into the lake together, they stuck close by one another. They swam with ease and integrated well with the other ducks on the lake.